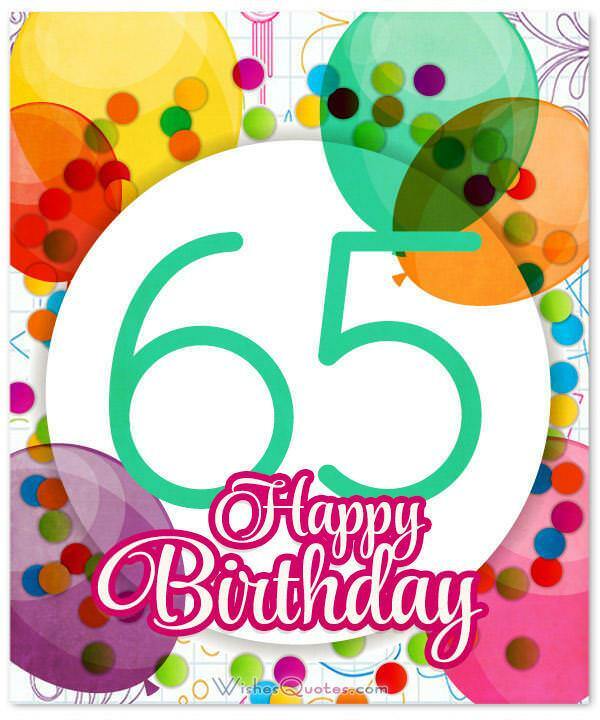 Amazing 65th Birthday Wishes to Send to your Family and Loved Ones. A collection of the sweetest and most extraordinary 65th birthday wishes that are guaranteed to make any 65-year old wish they could live up to 130 just so they can hear more! 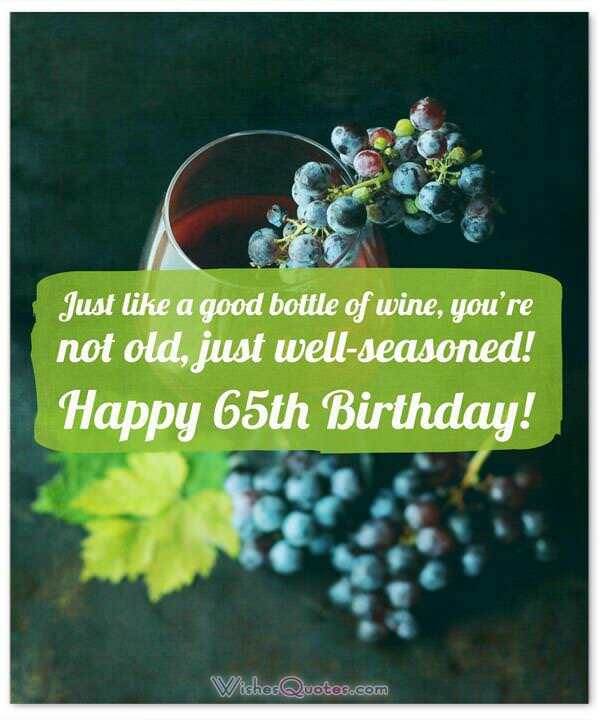 There is no better way to show someone you care, than a well-thought-out wish on their birthday, alongside a hand-written card with the best turning 65 quotes. 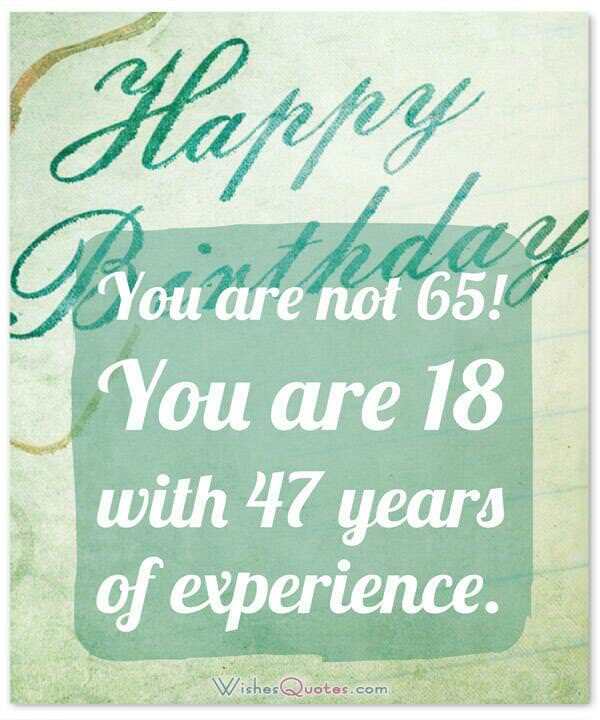 This is why we have provided you with the best happy 65th birthday messages on the internet! You could use them as they are, or if you choose to bring out the creativity in you, use them as inspiration! Another year, another story to tell. With more adventures to come and create bed-time stories for the grand kids! Happy Birthday! One can only say they’ve explored the world when they have lived as long as you, because you’ve seen the world change, times come and go, and endured it all. You truly are a fighter. Happy Birthday! You’ve always been an exemplary figure around the house, with all the kids constantly looking up to you, as the funny person with the crazy stories. I truly wish that those 65 years, one day turn to 130! Happy Birthday! You’ve always been here for everyone in the family, constantly being a source of valuable consultation and a shoulder to cry on. Without you, this family couldn’t function, so may these 65 years of yours turn to 130 one day! Happy 65th Birthday! I know that with the age, health problems have started to appear. You have always been a fighter though, with enough inner strength to move mountains, and a smile bright enough to blind the sun, I’m sure you’ll have no issues getting through them at all! Happy Birthday! You’ve single-handedly made the family gatherings a funny and pleasant occasion to attend! With your funny stories and crazy ideas, you’ve always been one of the columns that support this family. Happy Birthday! I would wish for all of your dreams to come true, as they usually do on these occasions, but I’m pretty sure you’ve already achieved all of them! So, I will wish for you to find a good bottle of wine and a quiet place so you can have one of your world-famous siestas without any interruptions! Happy 65th Birthday! You may have grown old in the flesh, but to our eyes, you still are that energetic young man that once came to our family to turn the world upside down with their amazing personality and witty humor. Never stop being that amazing person. Happy 65th Birthday! Every kingdom needs its elders to function properly, guided by their endless wisdom and experience. This is exactly what you’ve been to us, an endless source of wisdom to guide us through the difficulties of life. May you always be the kind and wise person you are today, till the day you hit 130! Happy Birthday! 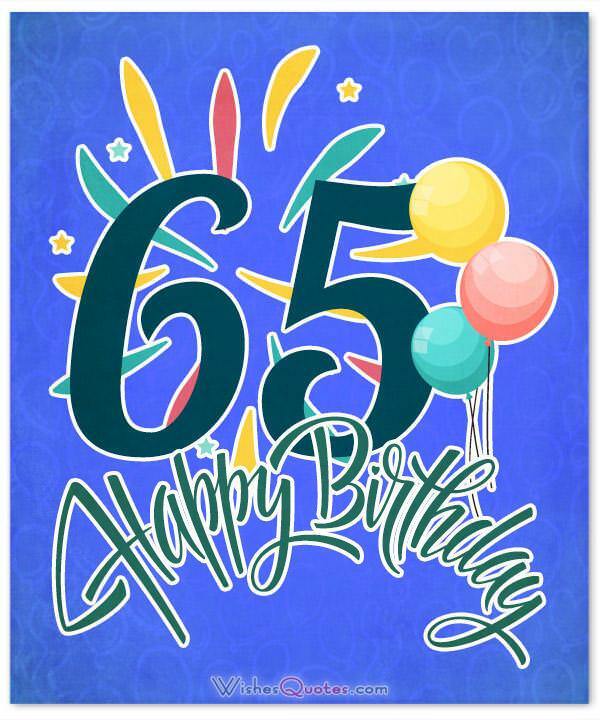 On this very special day, you begin a new chapter in your life, which I sincerely hope that it brings you all the happiness of the previous 64 combined! Happy Birthday! There is only one recipe for success, and that is to always keep a positive outlook on life and be caring towards your loved ones. This is why I consider you one of the most successful people I know because you do that without any effort. Happy 65th Birthday! No matter what anyone says, it doesn’t matter what is your age on the outside, it only matters how old you are on the inside. And with the spirit and endurance of an 18-year old, I say that you still have a long way to go before you can call yourself old! Happy Birthday! As you begin the 65th year of your life, I’d like you to know that you still have a long road ahead in your journey, so you have nothing to worry about, you’re still as young as ever! Happy Birthday! With this message, I send to you my most heartfelt wishes, so that you can have the happiest of birthdays! Always remember, 65 is just a number, all that matters is the energy and will you have to live! Happy Birthday! If this was a game, you’d be a veteran! You would have played all the levels and unlocked all the achievements. So, instead of feeling old, feel proud, most people would be jealous of everything you’ve accomplished. Happy 65th Birthday! My only wish for you, on this special day of yours, is to maintain the wisdom of the 65year old you are but have the energy and endurance of an 18-year-old! Happy Birthday! Another day, another reason to celebrate. You don’t have to feel sad about turning older, you have to feel excited because you’re embarking on new adventures, that you will overcome with the wisdom you have attained over the years! Happy Birthday! I know that you’ve missed feeling young and energetic, but you have absolutely nothing to worry about. You’re still as amazing as you were when you were young, but you have the wisdom you’ve attained on top of that! Happy Birthday! Just like a good bottle of wine, you’re not old, just well-seasoned! Happy 65th Birthday! With a smile made of plastic and a heart made of gold, you may be old in the flesh but still young in the soul! Happy 65th Birthday! 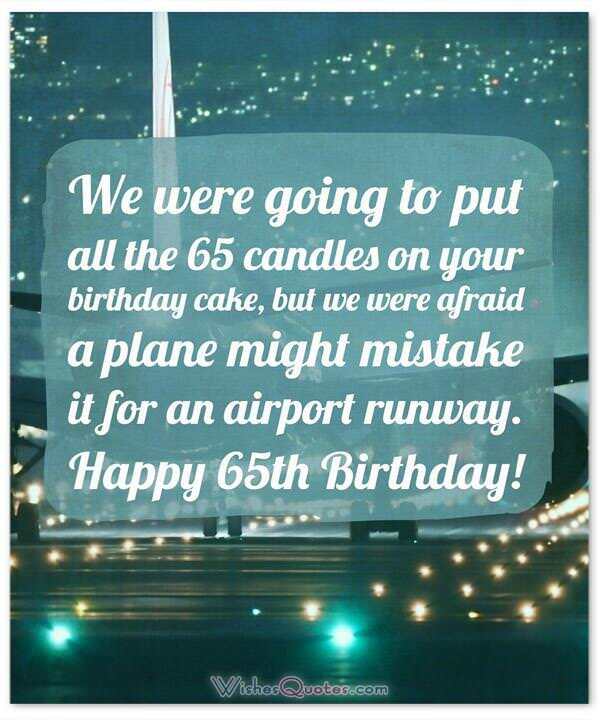 We were going to put all the 65 candles on your birthday cake, but we were afraid a plane might mistake it for an airport runway. Happy 65th Birthday! Do you know what the best thing when turning 65 is? No more annoying calls from life insurance salesmen. Happy 65th Birthday! At 65 it’s very important to be on time for your birthday party. If you’re a few minutes late your friends might be napping. You are not 65! You are 18 with 47 years of experience. The best think when turning 65 is all the new skills you have! You can laugh, sneeze, pee and cough… all at the same time! 65 are not for the weak! Happy 65th Birthday! Youth is overrated! 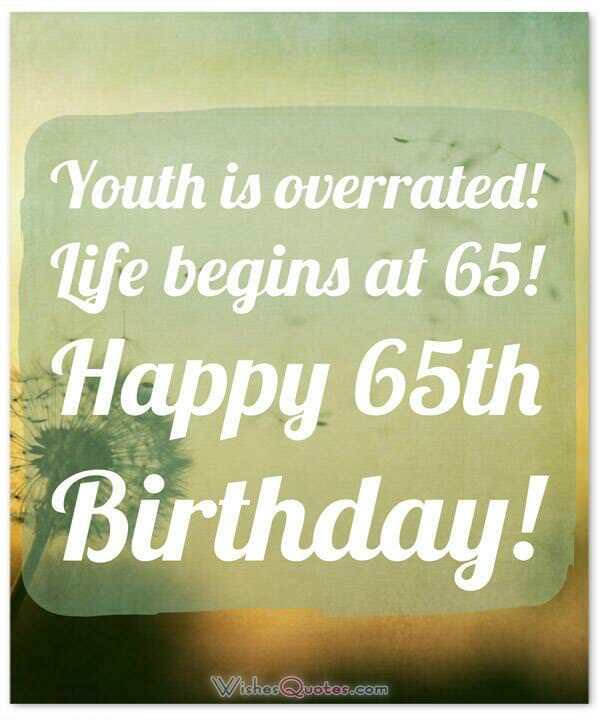 Life begins at 65! Happy 65th Birthday!